Florida Training Academy - Become a Certified Nursing Assistant (CNA) in Jacksonville, Florida. Florida Training Academy (formerly Perfect CNA Training Academy) is Registered Nurse owned and operated. We offer CNA, CPR, BLS, ACLS and First Aid classes. In addition, we also offer onsite CPR and First Aid classes to groups, small businesses, corporations and government entities. Register for your class with Florida Training Academy today! Become a Certified Nursing Assistant (CNA) in Jacksonville, Florida. Florida Training Academy (formerly Perfect CNA Training Academy) is Registered Nurse owned and operated. We offer CNA, CPR, BLS, ACLS and First Aid classes. In addition, we also offer onsite CPR and First Aid classes to groups, small businesses, corporations and government entities. Register for your class with Florida Training Academy today! 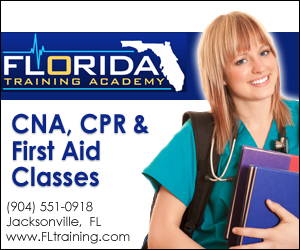 Florida Training Academy (formerly Perfect CNA) has been a leader in health, emergency and safety training since 2008. We are a privately owned training facility with locations in Jacksonville, Florida. We offer training classes and career certifcations for multiple professions that are fast, educational and affordable. Choose Florida Training Academy and Learn with Confidence. Why spend thousands of dollars and months in school to learn basic caregiver skills? Florida Training Academy has been successfully preparing students to challenge and pass the Florida Certified Nursing Assistant exam since 2008. Our Fast Track 2 Day CNA Exam Prep classes are only $200. Find out why thousands of medical professionals have chosen to be trained by the staff of Florida Training Academy. We also offer American Heart Association CPR, BLS, ACLS and First Aid training classes to anyone who has a duty to respond during an emergency. Register for your class today. If you do not know which class best fits your needs, we will gladly assist you. We offer CPR and BLS classes 2 or more days per week in Jacksonville, Florida. Same day (urgent) and "on-site" training classes may be scheduled for an additional fee. In addition, our CPR, BLS and ACLS Skills Sessions and Skills Checkoffs are offered weekly. Click here to view our class schedules and to register for an upcoming class at either of our locations. You can also call us at (904) 551-0918 or email our Director if you have questions or immediate needs. Please click here to visit Florida Training Academy's main website www.FLtraining.com.